Our 3- and 4-year-olds are bursting with imagination, creativity and responsibility. As they form friendships and develop conflict resolution skills, they also focus on early literacy and pre-math skills. 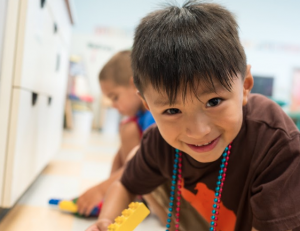 By the time they graduate preschool, over 90% of our children are fully ready to succeed in kindergarten (compared to 73% of Minnesota peers). The role of the teacher is to know each child’s individual likes and learning styles to provide learning experiences and variety in the classroom following our curriculum. The teacher’s role during play time is connected to the child’s learning and developing. To help our children reach early learning standards, we provide materials and activities to progress skills. These activities are appropriate to each level of ability. Preschoolers learn by doing, not by being told what to do. We provide creative experiences that encourage exploration – finger-paint, water colors, paper, glue, markers, etc. We provide enough time to explore, play and experiment. Sharing language with preschoolers is part of the learning process. We provide many opportunities for conversation, sharing ideas, asking questions and helping each other. YWCA Minneapolis has five convenient locations which are NAEYC-accredited and 4-star Parent Aware Rated.